Materials: 1″x12″x8′ pine board and a 1″x6″x6′ pine board note it could have been built with a single 1″x12″x8′ with a perfect board. The greatest challenge I would say is getting the finger joints to seat well on all sides, I am still finding my fit to be a bit tight, and a bit of swelling with the glue. It’s a bit harder with a single wide board I imagine as well and lack of a planer. Shaker inspired step stool with handle – I had to do it on a shoe string budget so I used 2 pine boards. I had a bit of and idea in my head and this is what I came up with on the fly that afternoon. 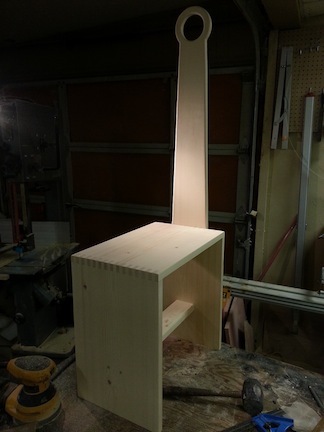 Basically a higher step stool based on Shaker style with a handle, something I definitely need around the shop. I got up to start early but ended up being around noon because the boards I had in mind were cracked, so I had to run around looking for something decent. Basically I cut 3 equal parts, and used a box joint sled that I made up a while ago with the forrest box joint blade set I purchased from lee valley. At this point it was a bit hard to keep track of the grain… I drew up a idea for the handle full size on paper. I made a jig for the bandsaw I once saw in a video using a cut nail as a pivot in order to cut a semi circle for the handle, the inner circle was done with a hole saw. I mocked it all up and was happy with the layout. I proceeded to glue up the box, make a center brace then routed and sanded the handle and brace. Sanded the base and then installed the handle and brace. Over all I’m really happy with it! I will revisit this design once I can afford or come across some nicer wood, but as it stands I have been spending every last cent on renovating the shop and buying tools. Suggestion for the next build – a wood version of the systainer toolbox, or I like the idea of say doing something with a set budget what can you do for $25 in the home store or specific materials like the 2×4 challenge. Thanks Chris for putting this all together!